If you want different in your life… you have to do something different. Change your life by moving in the right direction . You need to be intentional about what you do everyday in order to get where you want to go. Mailing Address: Success 4 UR Life , Inc.
Los Angeles , CA 90045. Cory J Chapman is a dynamic speaker, author, and personal finance coach extraordinaire. He has reached millions around the globe and personally seen tens-of-thousands of success stories amongst those who have taken his advice to heart and acted on it. 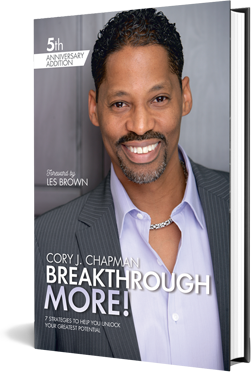 Free chapter with worksheets to the new strategies of this 5th year edition of Breakthrough. Upload new cover of Breakthrough More.